The President of the Union of Students in Ireland (USI), Laura Harmon, has warned this morning (Thursday) that a combination of a shortfall of purpose-built accommodation for students and the current state of the private rental sector will inevitably lead to students being forced to drop out of college. Harmon’s warning comes less than a month before CAO offers are set for release. Parents and prospective students are already facing difficulties, with all 3,000 purpose-built student beds in the city now booked out for the coming academic year. 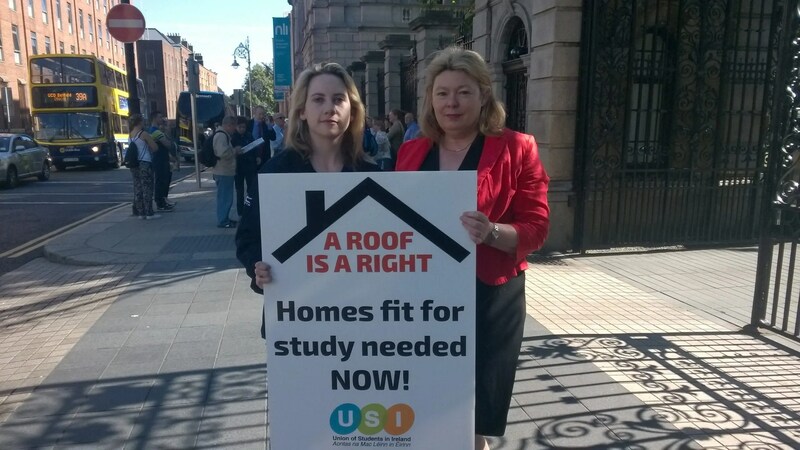 USI is calling on government to urgently make provision for student accommodation in the capital and campus towns. Rents across Ireland are rising, but rises are particularly pronounced in Dublin, where there is a 13% increase in on-campus rental prices. A report by the Higher Education Authority released earlier this week highlighted high levels of drop-outs, particularly from students reliant on the student grant. Rental availability is known to be a key factor in drop-outs. USI President Laura Harmon met with Senator Aideen Hayden, who has raised the issue of student accommodation shortfall in the Senate. Photo for free distribution when used with story. Click for high res.